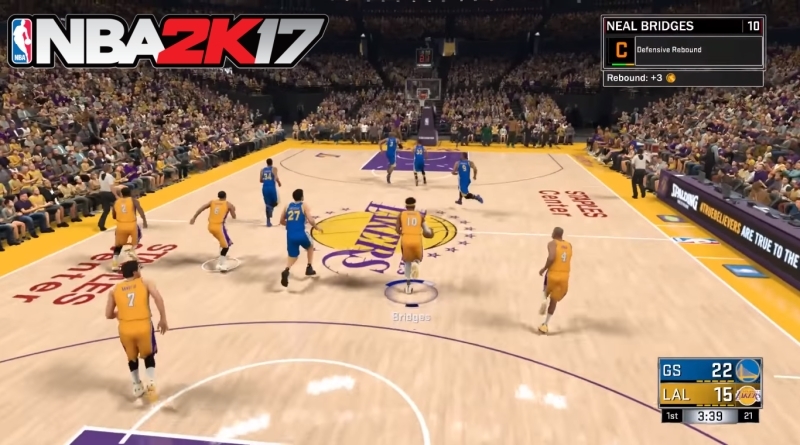 NBA 2K17 is the latest sports simulation basketball game in NBA game series. The game is planned to be released on 20th September, 2016 for PC, Xbox One, Xbox 360, PS 4 and PS 3. NBA 2K17 is one of the Top 10 Amazing Games coming this month. As the release date for the game is closing, PSN Profiles has released the list of all the trophies that gamers can unlock in NBA 2K17. The game has a total of 46 trophies to unlock. There is a Platinum, 2 Gold, 9 Silver and 34 Bronze Trophies. 1 – …One with Everything (Platinum Trophy): Earn all the trophies in NBA 2K17. 2 – Ticker Tape (Gold Trophy): Win NBA Championship in The Association game mode. 3 – Immortality (Gold Trophy): Make Hall of Fame in the MyCAREER game mode. 4 – You’re Officially Hot (Silver Trophy): Win five Versus matches consecutively. 5 – The Closer (Silver Trophy): Hold opposing team to 0 points in a final 2 minutes of the non-simulated game. 6 – Some more Special than Others (Silver Trophy): Buy & equip five Signature Skills in MyCAREER game mode simultaneously. 7 – My All-Star (Silver Trophy): Be named as an NBA All-Star in the MyCAREER game mode. 8 – Man of the People (Silver Trophy): Get 2 Million fans in the MyCAREER game mode. 9 – I’m Here to Stay (Silver Trophy): Get 1 Million fans in the MyCAREER game mode. 10 – Hamilton (Silver Trophy): Win Ten Versus matches in total. 11 – Buzzer Beater (Silver Trophy): In the non-simulated game, make the game winning shot as there’s no time left on a clock. 12 – 82-0 (Silver Trophy): Finish a team’s Schedule in the MyTEAM. 13 – Wire to Wire (Bronze Trophy): Don’t allow opponent to lead a game at any point in the non-simulated game. 14 – Trip-Dub (Bronze Trophy): Record the triple double with a player in the non-simulated game. 15 – This One Counts (Bronze Trophy): Win 1 online Versus match. 16 – The Sum of Its Parts (Bronze Trophy): Play the Team-Up Game. 17 – The Here and Now (Bronze Trophy): Begin the Association. 18 – Swat and Swipe (Bronze Trophy): Record at least five blocks and five steals with a team in the non-simulated game. 19 – Streaking (Bronze Trophy): Win five non-simulated games in The Association game mode consecutively. 20 – Smothering (Bronze Trophy): Hold opposing team’s FG% below 40 % in the non-simulated game. 21 – Serving Notice (Bronze Trophy): Get 250K fans in the MyCAREER game mode. 22 – Puppet Master (Bronze Trophy): Adjust the Total Sim Control strategy in The Association/Season game mode. 23 – On the Road Again (Bronze Trophy): Play online the MyPLAYER Blacktop game. 24 – Now Playing (Bronze Trophy): buy the pre-game ritual in the MyCAREER game mode. 25 – NBA Cares (Bronze Trophy): Donate to NBA Cares global community outreach initiative in the MyCAREER game mode. 26 – MyPLAYER of the Game (Bronze Trophy): Be named a Player of the Game in the MyCAREER game mode. 27 – My Every Day Player (Bronze Trophy): Become teh starter in NBA in the MyCAREER game Mode. 28 – Men of Steal (Bronze Trophy): Record minimum Ten steals with in the non-simulated game. 29 – Maestro (Bronze Trophy): In 2K Shoe Creator, create a shoe. 30 – It’s Raining (Bronze Trophy): Make 3-pointers with any team for a minimum of 15 times in the non-simulated game. 31 – Lincoln (Bronze Trophy): Win total of five Versus matches. 32 – Human Highlight (Bronze Trophy): Win Slam Dunk Contest. 33 – It’s Got to be the Crews (Bronze Trophy): Winning is everything. Get a W as part of the Crew. 34 – Five by Five (Bronze Trophy): Record minimum of 5 different stats with a player in the non-simulated game. 35 – Giveth and Taketh Away (Bronze Trophy): Record minimum of 10 rebounds & assists with a player in the non-simulated game. 36 – Hey Mr. DJ (Bronze Trophy): Create the 2K Beats Playlist. 37 – Hold the Fat Lady (Bronze Trophy): Start 4th period losing by 10 or 10+ points and then win in the non-simulated game. 38 – Freshness (Bronze Trophy): Buy the Booster in the MyTEAM game mode. 39 – Everyone is Special (Bronze Trophy): Buy & equip one Signature Skill in the MyCAREER game mode. 40 – Dawn of an Era (Bronze Trophy): Get drafted as the lottery pick in NBA draft in the MyCAREER game mode. 41 – Both Feet on the Ground (Bronze Trophy): Sign endorsement contract with Jordan/Nike in the MyCAREER game mode. 42 – Come Fly with Me (Bronze Trophy): Buy dunk package of Michael Jordan (Historic Jordan) in the MyCAREER game mode. 43 – Block Party (Bronze Trophy): Record 10 or 10+ blocks with in the non-simulated game. 44 – Dub-Dub (Bronze Trophy): Record 2 double doubles with your teammates in a same non-simulated game. 45 – Another Day, Another Win (Bronze Trophy): Win five NBA Today match-ups. 46 – Back to Back to Back (Bronze Trophy): Win three Versus matches consecutively. Copyright © 2019 FunkyVideoGames. All rights reserved.